After binging on Seattle‘s superb doughnuts in early March [See: Top Pot, Dahlia Lounge, Frost], I arrived home with a keen interest in finding Los Angeles’ choicest deep-fried morsels. While attempting to relive the past usually ends in disappointment, I had faith in my dear city. After all, with independent doughnut shops occupying every other block, there are bound to be some delicious finds, right? 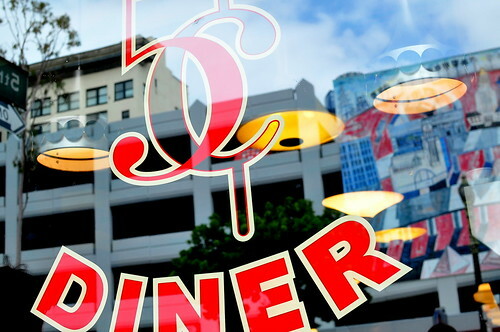 The great doughnut hunt began at downtown’s Nickel Diner, home to one of the city’s most beloved doughnuts. The Astronomer and I brunched here with my gal pals Bex and Laurie days after pastry chef Sharlena Fong announced that she would be leaving the establishment. Even though Chef Fong was no longer in the kitchen when we dined, every sweet had her down-home and quirky stamp on them. While The Astronomer and Laurie ordered sensible brunch items like huevos rancheros and French toast, Bex and I went hog wild over doughnuts. The infamous maple-bacon was the first to arrive. 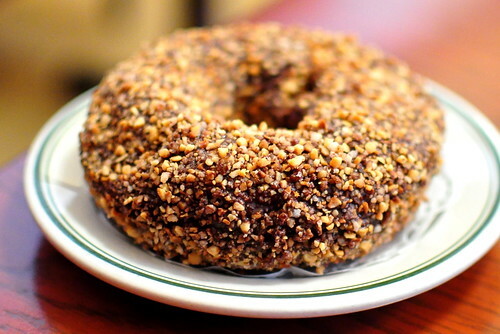 Coated in a sweet glaze and studded with bacon crumbles, the doughnut looked absolutely delectable. While I was hoping for fireworks at first bite, all I got were a few measly sparks. The icing and bacon were a winning combination, but the doughnut’s texture sat awkwardly in between fluffy and cakey. A lighter and more delicate doughnut would’ve sealed the deal for me. Unfortunately, the bulk of the restaurant’s doughnuts are based on the same plain doughnut as the maple-bacon. As a result, I liked everything about the Nutella doughnut but the actual dough. The crisp outer layer of hazelnuts and Nutella was delightful. The Clockwork Orange doughnut was also held back by the weak plain doughnut. Although essence of orange was apparent in the icing, it was totally lacking in the batter—a little zest would’ve gone a long way. The red velvet doughnut took me by surprise with its unique texture and tangy cream cheese icing. Whereas the other doughnuts were texturally one dimensional, this one was coated in a crunchy crust of red velvet cake crumbs. Its shape reminded me of The Donut Man’s strawberry doughnuts. 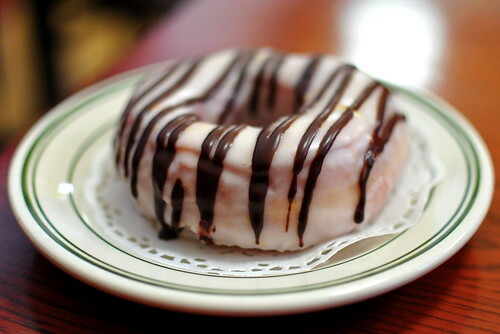 Nickel Diner’s doughnuts are certainly interesting, but the less-than-stellar principle dough keeps each creation from reaching its full potential. Perhaps the new pastry chef will tweak the recipe now that Chef Fong is out the door. While I normally don’t remark on service, it must be noted that an extremely rude manager essentially told our group to get lost after we paid the bill. There’s a polite way to say just about anything; it was a shame that she couldn’t be bothered to use her manners. Anyway, what’s your favorite doughnut shop in Los Angeles? I was flipping through this month’s Maxim, and there was a donut section, which totally made me think of you! In California, they recommend Psycho Donuts in Campbell (for the S’mores donut) and Stan’s Donuts in Westwood (for the Peanut butter and fresh banana donut with chocolate chips). Top Pot in Seattle was on the list too! 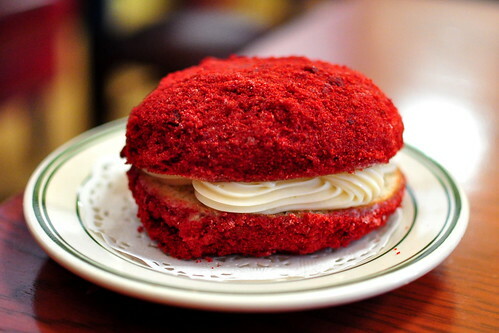 Big time bummer about the Red Velvet donut at Nickel Diner. I love the fact that you returned from a donut extravaganza hungry for…donuts. You have a belly of steel. After your Seattle post on donuts, I’ve been curious to find the best donut in San Diego. 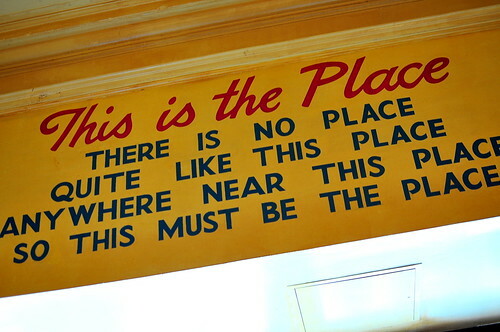 Unfortunately, there aren’t nearly as many promising places to try as in LA. Must visit this place for the pop tarts! I wasn’t all that impressed when we stopped by the Nickel Diner to sample the bacon doughnut during that Downtown food truck tour. 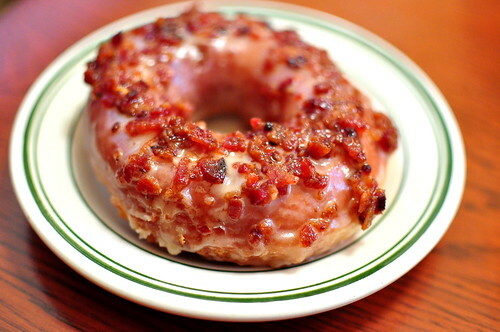 It just seemed like a regular doughnut jazzed up by bacon! I would have recommended Grace’s to you, but my last visit there for doughnuts was very disappointing. I do hear good things about the apple fritter at Bob’s at 3rd & Fairfax… we should go sometime! I was about to get a Stan’s Doughnut today in Westwood but didn’t have any cash on me, so I had to pass. I need to go to Doughnut Man’s too. I’d say my favorite doughy treats are Louk’s Greek doughnuts. I like the traditional honey ones. I just had my third strawberry donut yesterday at The Donut Man. Good stuff, but I think I like the strawberries more than the actual donut. I’ve been to Nickel Diner several times, but I still haven’t tried the infamous maple-bacon. It has been sold out every single time. The universe is conspiring against me. My absolute favorite is Bob’s Doughnuts at the Farmers Market (3rd & Fairfax). Their filled chocolate longjohn is not to be missed! It tastes like a Boston cream pie doughnut. I’m getting 2 more reasons by Fong may have left: the manager was a mismanager and/or her doughnuts aren’t so special. That is too bad that he donuts didn’t lived up to their full potential. How rude is that of a Manager to tell you guys to leave. In this economy (really in any economy) they should be bending over backward to keep customers happy and coming back. i hate rude people. hey i just wanted to let you know that it still says fiance in the title of your homepage. just view the source code and you’ll see it. I second the banana and peanut butter doughnut from Stan’s with the chocolate chips. It’s pretty outstanding in every way. Sharlena actually left The Nickel months ago to start her own bakery. the red velvet donut looks good! but yuck for the manager…hate rude people. i agree 100% with the duo dishes. the best things by far at nickel are their homemade poptarts! I’ve gotten addicted to the apple fritters and the apple crepes at Randy’s Donuts. Randy’s is the place with the big donut on top that you see in a lot of movies. It’s right off the 405 down towards LAX.